Brador's Invasions: The Underground Cell Inner Chamber Key opens the final cell in the Underground Cells area - a cell that houses Brador. After reaching the Lighthouse Hut, Brador will start invading your world in fixed locations until you go to his cell and kill him. But that does not mean you should rush there and finish him off straight away.There are four places in total that Brador will invade, and for each of those locations you kill him in you will get a piece of his Attire set, so if you want the full set, you'll have to kill him at each location. Three of his invading locations you'll encounter naturally as you progress through the rest of this area, and the forth one is near his cell, so you can leave it for last when you go there to finish him off. Even after you kill him when he invades as a phantom, he will still keep appearing in those locations until you kill his physical body in the cell. Another reason to go there and kill him once you have the full Attire set is that he drops the Bloodletter weapon, and that is the only way to acquire it. Get Accursed Brew: If you talk to the Fishing Hamlet Priest while you have the Milkweed Caryll Rune equipped, he will react to your Lumenwood appearance and speak to you differently. At the end of that dialogue he will give you the Accursed Brew. Sinister Bell Ringer (Online): Bell Ringer, follow the Cliffside Trail from Plaza Well, next to ladder shortcut. Next one is located at the elevator Cave, in the pit, under the elevator before the Coast where Orphan of Kos resides. When “bell-ringer woman” is present, versus PvP invasions are possible. After dropping down from the Astral Clocktower you'll land on a narrow dirt path that's flanked on either side by water. Be very careful when exploring this area because the land does not extended very far out from the path and it drops off suddenly. Along the path you'll find a couple of items, and since they're near the edge of the land, make sure to aim your camera down to give you a better view through the water. As you get close to the village, the mysterious figure of the Fishing Hamlet Priest will start walking towards you while rambling incoherently. After you've listened to his initial dialogue, you can talk to him for more information. You cannot, however, kill this character; even if you deplete all of his health he will simply stand up and continue walking through the area. 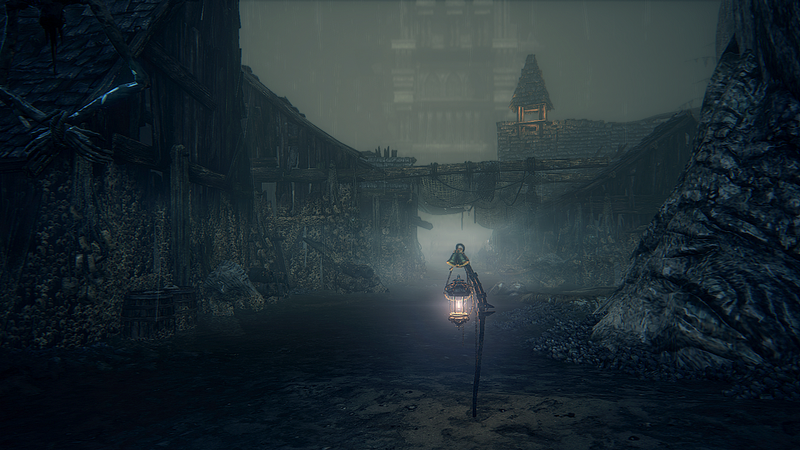 Follow the path along between the buildings to enter the Fishing Hamlet proper, and just after that you'll come to the Fishing Hamlet lamp. When you near the end of the first building along this alley you'll see a large creature walk past an open window up ahead, and while you will have to face it later, you don't have to worry about it right now. After rounding the corner there's an item near a building on the other side of the small courtyard, and just in front of it you can see the fin of a submerged creature swimming back and forth. The creature is a Fishman, and if you wait too long or approach the item it will leap out of the water and attack you, so it's best to run up and kill it first before it can retaliate. Upon turning the corner here, a Fishman will step out of a small alcove just ahead on the right. Hold your ground instead of running over and attacking it because a group of four more Flshmen will also start running towards you from further ahead. The group will reach you In a staggered fashion rather than all at once, so if you retreat back and use the corner to hinder their movements you can take them out one at a time as they reach you. There's a Fishman standing with his back to you just outside the entrance to this house. If you walk up the stairs quietly, you can sneak up behind it and use a charged R2 to stagger it for an easy victory. This is the building that you saw the creature in earlier, but since you just killed It, you can safely enter and get the Item In the corner. There's another Item up on a broken staircase, but you can only reach It by entering via the upper floor later. Be careful as you approach this open clearing - if you run In recklessly it's very easy to attract the attention of a large number of enemies and become overwhelmed quickly. The most immediate threat is a Fishman (Curse) sat near the well. This enemy will fire large volleys of homing skulls at you that have considerable range and tracking capabilities, which makes fighting other enemies In the area problematic. Just in front of that enemy are two more Fishmen, and they will come running towards you as soon as the other one starts firing skulls at you. The easiest way to take them out is to retreat back to outside of the skull's range before fighting the other Flshmen. Once those first two enemies have been killed, run back towards the well and kill the Fishman there. He has very little health so it will only take a single hit. Be sure not to go past the well, however, otherwise you'll get the attention of a bomb-throwing Fishman in the large building nearby, as well as the other Fishmen along the water bank, you should see another Fishman that has already spotted you, but instead of attacking you it just patrols back and forth as if daring you approach. If you do start approaching, a Giant Fishman will come walking out from behind the building nearby and start attacking you. This enemy is extremely dangerous and can inflict a massive amount of damage, so you need to be very cautious. Along the side of that building you'll notice some oil urns with a small flame flickering in them; If you time it correctly you can move forward until you hear the Giant Fishman, and use a firearm or explosive to detonate them and damage it. By far the safest option for dealing with the Giant Fishman here is to retreat back down to the Fisherman's Flesidence. The giant enemy cannot pass through the doorway of the residence, so you can safely wait for one of its attacks to miss, and then hit it while It recovers. Once it's dead, go back to where you first encountered it and head round the corner to reach an area with an item and another Fishman. Be careful as you approach that item because a second Fishman will appear from under the building - so make sure you kill the first one quickly. If you look closely at the well in the middle of the plaza you'll notice that there is a ladder that you can use to reach a cave below the plaza. Within that cave an Anchor-wielding Giant Fishman patrols around a central column. Once its health reaches around 40%, a second Giant Fishman will drop down from the ceiling. Fighting both of those enemies at this point is extremely difficult, and you can have a much easier time be approaching this area through a tunnel you'll access later. If you choose to fight them now, the central column can help you a lot, since you can use it to restrict both the movement and attack angles of the Giant Fishmen by constantly moving around it. Poison Knives can also be very effective here, because the Poison can take off large amounts of health while you're waiting for a safe time to attack. The second Giant Fishman will drop the Rakuyo weapon when it's killed, so whichever approach you take, it's worth taking the time to kill them. There are a lot of enemies in and around this large building, so as is often the case, a cautious approach is best. Start by approaching the building while hugging the right-hand side of the plaza - that will allow you to get close while remaining undetected - and then enter slowly through the doorway when you reach it. There's a Fishman just inside with its back to you, and if you're quiet you can sneak up behind it and use a charged R2 to stager it for a quick finish. There are three more Fishmen to contend with on this floor, but if you engage them in the correct order you'll only have to face them one at a time. The first one has its back to you in the middle near some oil-filled urns, the second is under the stairs nearby, and the final one is in the far corner of the room. If you shoot or throw a Molotov at the oil urns, the ensuing explosion will kill the enemy without alerting the others. You can then use a ranged attack on the enemy under the stairs to lure it towards you and fight it out of the ether enemy's line of sight. When only the enemy remains, run over and kill it before quietly going up the stairs. At the top of the stairs another Fishman will spot you; retreat back down the stairs so that it follows you and fight it on the floor below to avoid alerting a second Fishman on the upper floor. Go back up the stairs after dispatching that first foe, sneak up behind the one and use a charged R2 to stagger it and a visceral attack follow-up. Once all the enemies in the house have been defeated, run along the narrow ledge near the stairs to get the item at the end, and then go back down the stairs and out the front door to start cleaning up the last few Fishmen. Just after you exit the house, a nearby Fishman will come running towards you, so move back inside and fight it there to avoid alerting the other enemies. The remaining two are standing near the water's edge just off to the side of the house. If you're quiet you can sneak up behind the first one and use a charged R2 to stagger it for a quick kill, leaving only one to finish off afterwards. Try not to stand around in the open too much while fighting it, however, because there's another Fishman further up the hill that will start throwing harpoons down at you, so keep the fight behind the nearby wall. If you look along the base of the cliff you'll notice a series of oil urns highlighting a narrow path that you can follow to reach the rooftops. After picking up the item at the start of the first rooftop you come to, continue around the left-hand side to find a ladder that you can kick down to create a shortcut back to the lamp. Next to the ladder there's a hole in the wall that you can walk through to enter a building, and once inside you'll find a walkway leading to an adjacent building. Be very careful when you enter this second building, because there's a sneaky Fishman clinging to the roof just waiting to drop down and ambush you with a grab attack. The easiest way to avoid being grabbed is to slowly move into the room while hugging the wall on the right to cause it to drop down, and then quickly move backwards to avoid the grab. Another Fishman can be seen hacking up the remains of a poor villager at the opposite end of this building, and while it's distracted you can sneak up behind it and use a charged R2. Once the area is clear, make sure to pick up the item from the corpse the Fishman was chopping, because it's a full Attire set. Then go down the broken staircase to claim the item you could see when you entered the lower floor of this building earlier. If you peek out from behind the tree at the base of the hill you can safely bait the Fishman further up into throwing a harpoon into the tree. Once it does, you can quickly run up and attack it during the recovery. Try to kill it as quickly as possible, because once you reach that point a Fish Dog will come running down from behind the large tree nearby. This enemy is largely similar to other dog type enemies, the main difference being that it has an area of effect attack that, while doing no damage, will cause your character to stumble backwards. The best way to deal with it is to use a firearm to shoot it and knock it over to stop it from attacking, and then kill It as it gets up. Around this time a large group of enemies will start making their way towards you from further up the hill, so as soon as you've killed that Fish Dog, run up and take cover behind the large tree. The group of enemies consists of another. Fish Dog, two melee Fishmen, and two more that will hang back and throw harpoons. The Fish Dog will usually reach you first, so stick behind the tree while fighting it to shield yourself from the harpoons and hamper the approach of the two melee Fishmen, and then pick them off one at a time as they round the tree. Be careful when you run up to take on the two harpoon throwing Fishmen because there's yet another one further up the hill that will start throwing harpoons down at you while you attack them. Using hit-and run style tactics from behind the cover of the nearby wall is the safest way to kill them. Start making your way up towards the next harpoon Fishman, but don't attack it. When you get near it a Fishman (Curse) will start firing projectiles down at you. On top of that, another Giant Fishman will come running down from a path on the right, and you don't want to have to contend with all three at once. The Giant Fishman should be your first priority since it is by far the biggest threat, and there are a couple of ways you can go about dealing with it. If you're comfortable fighting these enemies out in the open, then retreat back down to the large tree and fight It there, so that you can use the tree for cover if needed. For a safer approach, carry on sprinting up the hill past all of the enemies and enter the Lighthouse Hut. The Giant Fishman will be unable to enter, so you can pick it off with ranged attacks, or wait for it to attack and then use melee strikes while it recovers. After it's dead, run back and kill the Fishman (Curse) before taking out the other Fishman to secure the area. When it's safe to do so, look for a narrow path between the buildings nearby that you can follow to find an Item. Lighthouse Hut lamp is directly in front of you upon entering the building, so before doing anything else, make sure you light it. Just to the side of the doorway you entered through you'll find an injured and collapsed Simon if you've been following his quest; talk to him a couple of times and you'll get Simon's Bowblade and the Underground Cell Inner Chamber Key as a parting gift. The gate in the room does not open from this side. The opening in the side wall of the house leads to a path you can follow down to another gate that you cannot open from this side. There is, however, and item in that area that you can pick up now if you wish. When you reach the top of the hill, follow the path around to a pair of wooden planks, and then walk along them to reach the large rooftop below. If Brador is still alive, you'll start hearing a bell ring as soon as you reach this rooftop to indicate that you're near one of his invading points, but he won't appear just yet so you can still survey the area. You can drop off either side of the rooftop to reach a platform below that gives access to the large house, but whether you intend to clear the area or simply run through it, a oetter option is to cross the wooden bridge leading off from the rooftop. Once you start walking on the bridge, however, Brador will invade on the other side and start coming towards you, so retreat back and fight him on the large rooftop where you have more room. After crossing the bridge you'll come to another rooftop, and if you just want to push through the area, you can go straight up the next set of planks and enter the Parasite Farm. There are a large number of Fishmen in this part of the village, and it's very easy to be overrun by them, especially if you happen to drop off to the Stilts area below. The safest approach is to sweep and clear the rooftops and building Interiors one at a time, while also using your elevated position to pick off some of the enemies below in safety. To begin with, start by slowly walking through the to reach a Fishman (Staff). If this enemy spots you it can fire barrages of lightning strikes that appear directly above you, so take advantage of the situation and deliver a charged R2 to its back before finishing it off. Backtrack slightly now and descend the ladder to reach a wooden platform. From there, walk slowly through the nearby doorway and sneak up behind the Fishman at the opposite end of the building, so that you can use a charged R2 to stagger it for an easy kill. Exit through the next doorway and follow the platform around until you reach another wooden bridge. From here you should be able to see a Fishman (Staff) standing towards the end of the next rooftop, and another Fishman patrolling along behind him. Wait for the patrolling Fishman to be at his closest point to you, and then cross the bridge so he spots you. Try to fight him on the section of rooftop just after the bridge. Be careful when fighting in this area, however, because there is a large hole on the other side of the apex, and if you drop through it you'll be surrounded by the group of enemies in the room below. After killing that enemy, sneak up behind the Fishman (Staff) and kill it. If you now go to to the left of the next wooden bridge and look down, you should be able to see a very large enemy group standing near some oil urns. By either shooting, or using a Molotov to make the urns explode, it’s possible to kill nearly all of them, and then you can finish off the rest using any ranged options you have. Another group of enemies consisting of two Fish Dogs and a Fishman patrol the area below the other side of the bridge, so if you still have plenty of ranged attacks left you can pick them off from this position. Cross the nearby wooden bridge now and approach the open doorway on the other side; as soon as you enter the building, a Wandering Nightmare will start running towards a hole in the floor - try to kill it before it reaches its goal. If it does drop down, it’s important that you don't follow it, because the area is surrounded by a large number of oil urns, and a nearby Fishman will throw a bomb to detonate them as soon as you land. The best way to deal with the situation is to blow them up yourself before dropping down by either shooting them or using a Molotov, and if you're quick, this will also kill the Wandering Nightmare if it did drop down. After clearing the trap, drop down yourself and immediately roll and kill the Fishman there. Follow the path around underneath the building to reach an item near the ledge, and then drop down into the water below. One of the main reasons to kill as many enemies from the rooftops as possible is because down here among the Stilts you'll be invaded by Brador if he's still alive. He will only invade after you have gone up the stairs near that position and entered the building, so it's important that you stay far away from there if you have other enemies chasing you. If you haven't already taken out any of the enemies, you'll be faced with a large numbers of enemies now, and while your first instinct may be to run through the nearby open doorway, there are more enemies in there, so you can end up making things worse. A better option is to run past the ladder (which will take you back up to the rooftops in case you need to get out) and around the back of the building to the left, until you come to the small set of stairs. You can use these stairs as a bottleneck to funnel the enemies towards you, and at any time you get pushed back, you can drop down and loop back behind them. Once you're done with them (or if you killed them earlier) slowly go through the doorway. Inside this building are four more Fishmen; if you make your way through it slowly and quietly, it possible to take them on one at a time. Start by sneaking around behind the one before killing it, and then take out the one near the opposite wall. From there you can walk around behind the next one, before killing the final one. Once the building has been cleared, exit through the nearby door and follow the building wall around to find an item hidden outside. The only thing left now is to enter the building to get the item there, and then be ready to fight Brador once again when you leave. Be very careful when moving around in this area because one wrong step and you can easily fall to your death. Most of the Fishmen in this area are busy tending to the parasites, but while they'll often have their backs to you, they will always detect you when you get close. You'll still have an advantage against them, however, since they'll have to get up and turn around, during which time you can start attacking them. To start with, hug the wall on the right as you enter, and then drop down onto the narrow ledge along the wall and follow it along to the first Fishman you can kill. Once that enemy is dead, go up the nearby ramp and do the same to the one at the top of it. Just past that second Fishman you'll see a Fishman (Staff) patrolling up and down another ramp; wait for it to start moving up the ramp and then sneak up behind it and attack it with a charged R2 if you get close enough, otherwise just attack it normally before it can start firing lightning bolts. Follow the path around to the right when you reach the top of that ramp, and then immediately turn left under the overhang and take out the Fishman there before getting the nearby item. From this location you'll be able to spot a group of Fishmen on the other side of a narrow beam, and another group on a large platform that Includes two Staff-wielding Fishmen. If you were to go for the platform first, you'd have to deal with both mages at once, so it’s best to go down the narrow beam. As soon as you step onto it, the three Fishmen on the other side will start running towards you, so move back on to solid ground and take them out one at a time as they reach you. When it's safe, cross the narrow beam, and then go up the stairs and quickly take out the Fishman (Staff) at the top. Shortly after you start attacking it another Fishman will come after you from the left, so keep the camera trained that way to see it coming. The second Fishman (Staff) will usually detect you during the fighting, but the large column nearby will easily shield you from its attacks until you're ready to go around and face it. The only enemy left after that should be a lone Fishman on the other side of the platform with its back to you. This one you can sneak right up behind to stagger it with a charged R2. The way forward is down a ladder at the back of this platform, but before you go down there, it's worth crossing back over the bridge and opening the gate there to create a shortcut back to the Lighthouse Hut lamp. At the bottom of the ladder you'll come to an area with a number of large pits filled with parasites that are divided by wooden walkways between them. Some of the large shells in these pits actually contain enemies called Snail Women, so it's best to attack any shells you come across just to avoid begin attacked from behind later. Their attacks don't have a lot of range and are quite slow, but they often wake In groups so you'll have to contend with a few at a time. The best way to deal with them is to use a weapon that has long reach, and try to hit the exposed torso rather than the shell from outside of their attack range. The first pit you come to can be skipped by simply following the walkway along and dropping down into the second pit when you come to it. If you do go Into the first pit then there are some planks at the end that you can walk up to reach the second pit. When you reach the tunnel leading out of this area, look just to the right of it and you'll see a small mound of parasites piled up over a wooden plank. You can walk over them to reach a small side area containing a Bloodstone Chunk. A short distance into the tunnel the path will split, with one branch going straight ahead and another off to the left. When you reach that point, two shell-less Snail Women will come swimming down from directly ahead to attack you. If Brador is still alive, you should also start hearing the sound of a bell in this area to indicate you’re near one of his invading locations. The path going straight is a dead-end so it's worth going that way first to get the Item. Be ready as you approach it, because Brador will appear directly behind you. Since he appears quite close to you here, try to attack him will he is still materializing to get an early lead. When heading down the other section of the tunnel, another shell-less Snail Woman will attack you almost straight away. Be ready to evade when you see her, and then at the far end of the tunnel there are two more of them, along with a Fishman (Curse). The best course of action there is to run past the two Snail Women and kill the Fishman first so you don't have to worry about evading its projectiles, and then finish off the Snail Women. Once everything is dead, go into the small alcove along this branch of the tunnel, and carefully drop down into the cave below. There's a large circular pit directly ahead when you land in this cave, so make sure you don't accidentally run into it, because even though it won't kill you outright, you will take a lot of damage. To get the item at the bottom of the pit safely, use the ladder that's on one side of it. Not too far from the pit there's a lever that you can pull, and doing so will lower an elevator platform over the pit. If you step onto the elevator it will take you up to a small room containing an item and a gate you can open that leads back into the Lighthouse Hut. As well as the elevator there are also two tunnels leading out from this cave - one takes you deeper into the caves for some exploration, and the other leads to a boss fight. The item that you can see near the pillar at the far end of this tunnel may appear tempting, but do not be lured in by the bait because two Winter Lanterns are patrolling the area just to the left of it. Before fighting these creatures, make sure your insight it as low as possible, have attire that has high frenzy resistance, and have sedatives at the ready. You can circle around the pillar to try to stay out of their gaze to reduce the frenzy build-up. If you just want to run along to the Lower Breeding Pit, you can sprint through the intersection and keep running to escape their gaze. To explore this section of the tunnel you will have to deal with both of the Winter Lanterns, but the reward for beating them is making another hard fight easier. From the ledge at the end of the tunnel you'll be looking down into the cave below the Plaza Well with the two Giant Fishmen. It's possible to fight them from here and make that encounter much safer. Although you'll see one of them clinging to the ceiling, you cannot actually hit it at this time. Use a ranged attack such as a throwing knife to hit the one at the back of the cave so that it comes closer. If you have Poison Throwing Knives they can also be very effective here for taking off large amounts of health. When they're close to the ledge, you can just move back out of the range of their attacks, and use a jumping attack to hit them during their recovery. If you drop down from the ledge you won't be able to get directly back up, so you'll need to climb the ladder out of the well and make your way back around to the Fishing Hamlet lamp so that you can warp to the Lighthouse Hut again. There are a large number of shell-less Snail Women near the entrance to this area, but if you approach it slowly you can lure them towards you either one at a time or in small manageable groups. If you need to create more space when fighting them, just retreat back down the tunnel. A Fishman (Staff) is also patrolling around the back of the first pit. As long as you don't rush in and pick off the Snail Women slowly, he'll usually have moved to a stationary position further in. Head to the left as soon as you enter the first pit, because there are a few more Snail Women in an alcove there and it's best to kill them before going any further in. The only things you should have to kill in the second section of the pit are a couple of Snail Women in their shells, near the wooden planks leading to the next section. Before killing them, however, you'll see a Fishman (Staff) standing on the other side of the wooden fence. You can attack and kill him through the fence before he can retaliate for an easy victory. Another Snail Woman will drop down near it so you can kill her safely from here too. In the third section of the pit the patrolling Fishman (Staff) from earlier, and two more shell-less Snail Women on the platform just behind it. If you're quick, you can run up and kill the Fishman before either of the Snail Women reaches you. This will allow you to then take both of them out normally afterwards. Now that the room is clear of threats, you can go up the stairs to the top of the platform and claim a highly coveted Blood Rock. The shell-less Snail Women in the tunnel here are all non-hostlle, and since they give no Blood Echoes if you kill them, you can just leave them to their worshiping if you wish. A cutscene will automatically trigger after you run a short distance along the beach. After this you'll be in the fight against the Orphan of Kos straight away, so make sure you've made all of you preparations before leaving the tunnel. 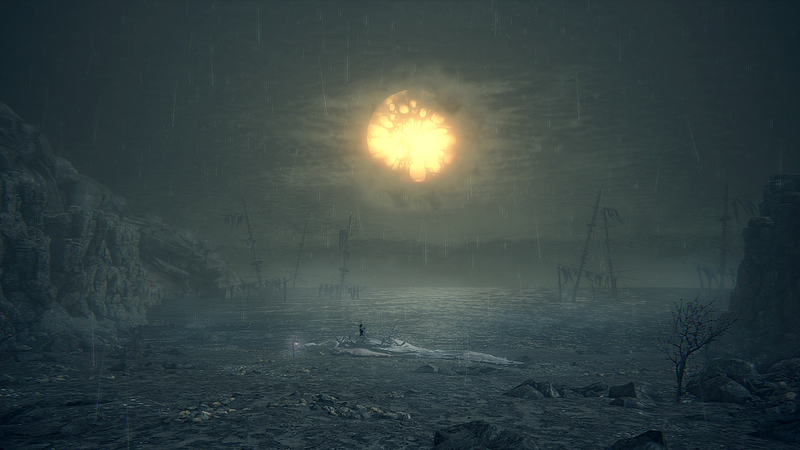 The Orphan of Kos initially moves around quite slowly, but once it gets within range it attacks extremely fast and doesn't give you a lot of time to react. The safest place to stand during the fight is just outside of its melee range, so that you can bait it into attacking, and then try to interrupt its attack strings. Upon defeating the boss you'll automatically receive the Kos Parasite, which becomes a very unique weapon if you equip it and the Milkweed Caryll Rune at the same time. 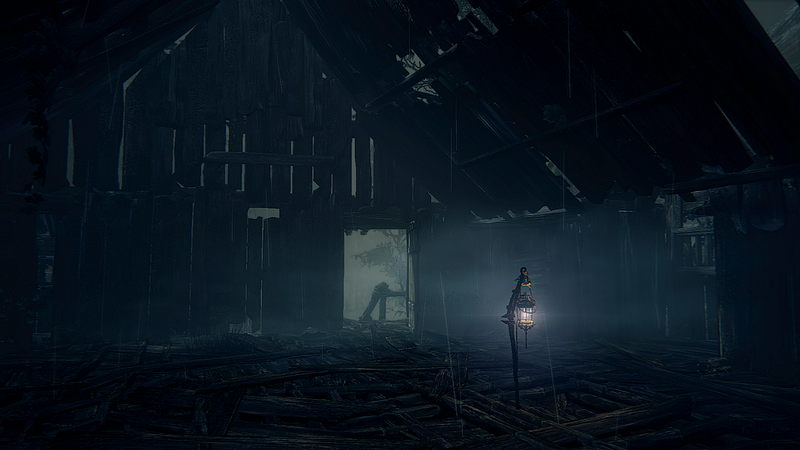 The new Coast lamp will also appear just in front of the Great One's body, and if you look to where the Orphan first appeared you'll notice a mysterious shadowy figure; attack the figure to trigger the final cutscene and complete your journey through this nightmare.